Walk for a few minutes to get your heart-rate up and muscles warm. Try parking your vehicle farther away or taking a walk around the clubhouse. Then do some gentle active stretches such as rolling your shoulders and neck, swinging your arms, and twisting your trunk. It is also important to warm-up your swing before hitting off the first tee. Start by doing some partial swings at a slow speed and then gradually building up to your full speed and range of motion over a few minutes. If you don’t get a chance to warm-up thoroughly before starting your round, swing a little easier for the first few holes. 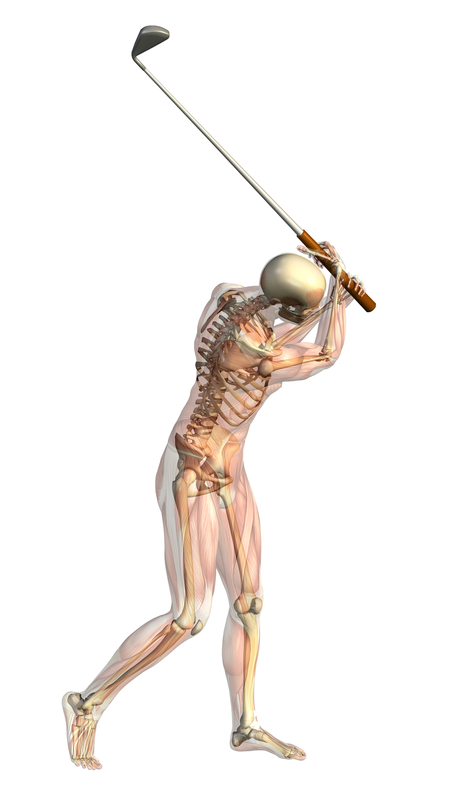 Taking hard swings when your body is cold is an easy way to strain muscles in your back, neck, shoulders, or elbows. 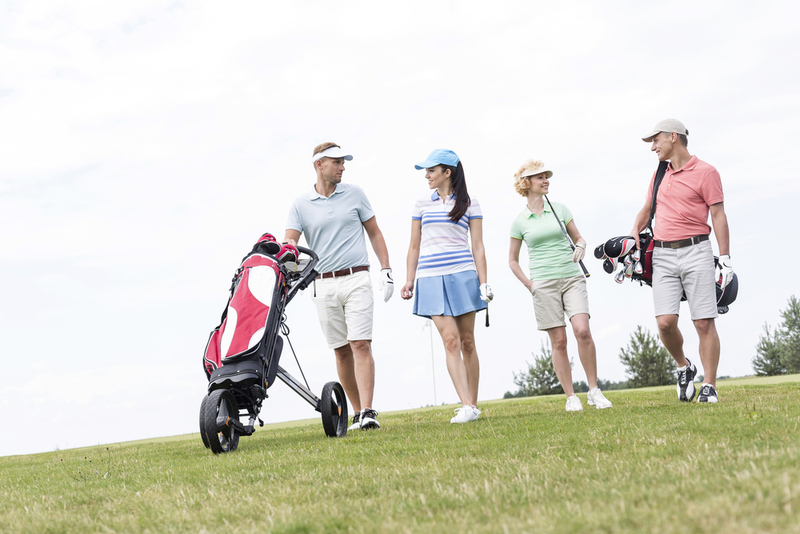 Wear proper footwear – 9 or 18 holes translates into a lot of walking, especially if you’re not driving a cart. Most golf courses present variable terrain and hills, so it is important to take care of your feet as best you can. Make sure your shoes are not old and worn out and that they are comfortable and providing the necessary support. This will help prevent injuries such as plantar fasciitis, Achilles tendonitis, ankle sprains, and blisters. Watch your posture – Between swinging, putting, and picking up your ball, a round of golf involves a lot of bending over. It is important to be aware of your posture in order to protect your back from pain or injury. When addressing the ball make sure you bend at the knees and hips and try to keep your back straight. Adopt a consistent stance that is comfortable for you. Avoid rounding your back when going to pick up your ball. Try squatting with your back straight, or if this bothers your knees try bracing yourself with your club against the ground and leaning over with a straight back to pick up the ball (the way you see the pros do it). Use proper body mechanics for lifting and pushing – Carrying your own bag or using a push cart can add a lot of extra strain on your back and upper body. Make sure that you engage your deep abdominal (TA) muscles before going to pick up your bag and bend your knees to use your legs muscles as much as you can. Avoid bending or twisting awkwardly with your back. When pushing your bag make sure you are standing up straight and not leaning forward too far; keep your cart relatively close to your body to optimize your control. Remember to use your leg muscles and engage your core when pushing up-hill. Get golf lessons – Because golf involves a lot of repetitive movement, a slight flaw in your swing could contribute to developing an overuse injury. Proper body mechanics are important to minimize strain on your joints, muscles, and tendons. Whether you are a beginner or experienced golfer it never hurts to get some help. A teaching professional will be able to evaluate your swing and teach you proper body mechanics for driving, chipping, and putting. Look for golf professionals who offer group or individual lessons in your local area. Hopefully this article has helped motivate you to stay healthy on the golf course. If you have specific concerns or an injury that needs treatment please do not hesitate to book an appointment with one of our physiotherapists. In an hour long one-on-one session we will comprehensively assess and diagnose your injury, as well as provide hands on treatment and a home exercise program. If your condition requires ongoing care we will work with you to formulate a treatment plan that fits your schedule and will help you meet your activity goals. We look forward to working with you, swing safely!